As winter approaches, the bloom is coming off the U.S. real estate market, with dire predictions for future home sales, rising interest rates and reports of growing housing inventories. But one long overlooked – and underestimated – housing sector continues to blossom: second home purchases. “Second home purchases accounted for more than a third of all home purchases last year,” reports an August issue of the industry publication, Realty Times, citing a 2005 study conducted by the National Association of Realtors (NAR). And a veteran Georgia realtor and industry watcher says the state is a part of that larger trend. Second home sales are being spurred by the wealth transition from aging parents to their baby boomer young, new and more favorable tax laws, rapid increases in home values, and jittery stock market investors seeking more stable environments for their cash. Buyers for these homes are widening a once-narrow real estate niche. In Georgia, second home buyers continue to pour into the mountains and coastal areas while downstate regions, especially those with prime lakeside properties available, are seeing increased interest as well. By many accounts, Georgia is becoming a haven for second home buyers thanks to relatively low prices, a varied and beautiful geography and a welcoming populace. From Rabun Gap to Tybee Light, Georgia realtors are gladly opening the doors to homes for what they believe to the advanced guard of a coming invasion. As a kid growing up in Brooklyn, John Casey thought owning a vacation home was a dream as remote as coming to bat at Ebbets Field wearing the uniform of his beloved Dodgers. What went right for Casey, 73, was an executive career that culminated eight years ago in his retirement as vice chairman and CFO of Wendy’s, the national fast food chain. And during his 19 years with the fast food giant, Casey went beyond mere vacations to owning second homes, first in rural Michigan, then on the east coast of Florida. In July 2005, Casey and his wife, Debbie, moved into their third second home, a new four-bedroom North Georgia rustic mountainside chateau overlooking sparkling Lake Blue Ridge. 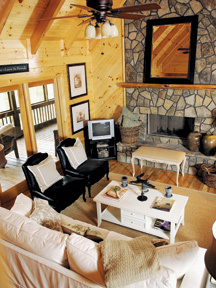 With six grown children and 14 grandchildren, the Caseys may find the Blue Ridge “cabin” a bit tight for a whole-family gathering, but it fits the couple just right. The Caseys maintain a primary residence near Columbus, Ohio, and the Michigan second home has been sold. The Florida second home has been placed in a family partnership “for tax purposes,” thus becoming part of the second home hand-me-down phenomenon. North Georgia second home buyers like John and Debbie Casey are becoming a larger part of the region’s population, thanks to the relative price structure, says Shelley Draper, the Casey’s real estate agent in the Blue Ridge purchase. Not only does Blue Ridge shelter hurricane refugees, it offers another form of protection that appeals to all second home buyers, Draper says. What’s being protected, according to the Forestry Service FY 2007 Fact Sheet, is “1,000 miles of primary trout and warm-water streams,” as well as 500 species of wildlife and the kind of vistas that inspire poets. Still, the Forest Service report also warns that the “… desire to be in the mountains has resulted in the rapid development of second homes in North Georgia and increased recreational demands on the national forest.” To meet those demands, the Forest Service has spent $5.4 million in the past three years to purchase ecologically important lands in the mountains, and more acquisitions have been proposed to preserve the scenic views and open more recreational opportunities. Frank Norton, Jr., president of the Norton Agency, a Gainesville-based real estate firm, is finding that North Georgia second home purchases are in line with the market studies. “Overall, we appear to be tracking national trends,” says Norton, whose company publishes the Native Intelligence Market Watch (www.nortonnorthga.com), an online study of north Georgia real estate sales data. “About 30 percent of all homes sold in North Georgia will be second homes. But there are other trends within that trend. About 80 percent of the houses sold on Lake Lanier in the last two years in the under-$800,000 market were second homes. In 1994, the remnants of a tropical depression hovering over Southwest Georgia poured constant rain on the region for almost a solid month, flooding homes to rooftop levels along Lake Blackshear, an 8,700-acre body of water 15 minutes off Interstate 75 in rural Crisp County. The flood was literally a watershed moment for the region’s second home market, washing away ramshackle cabins and rusting mobile homes along the Lake Blackshear shoreline. “Fifteen years ago, the lake had more of a fishing camp atmosphere, but the flood of ’94 changed all that,” says Cheryl Mason, owner-broker at Lake Blackshear Leisure Properties, Inc., and a resident of one of the second home communities that sprang up after the floodwaters receded. Located at the center of a triangle formed by Albany, Cordele and Americus, the privately owned lake is attracting second home buyers because, Mason says, of the easy access to the dozen or so golf courses in the area, upscale restaurants and markets, and the availability of recreational activities. Despite the development, the lake’s 77 miles of shoreline still hold potential. The local take on an old real estate mantra: “Price, price, price” explains it all, Mason says. A 3-bedroom, 3-bath home with a stone fireplace, rear deck and 75 feet of water frontage nestled in a quiet cove was recently for sale at $259,000, Mason says. “When I get a call from someone who tells me they want a 5,000-square-foot home on the lake, then I know we are looking at an $850,000 to $1 million price tag,” she adds. In many ways, the American second home buyer has been a mysterious figure. The real estate industry began scientifically tracking the phenomenon only three years ago. Since then, enough data has been collected to give solid shape to these typically upscale purchasers. A 2005 study conducted by the National Association of Realtors concluded that the second home buyer in today’s market is between 47 and 55 years old with a median income of about $100,000. And, according to the NAR study, 20 percent of these baby boomer buyers plan eventually to turn that second home into a primary residence. The NAR and other researchers have divided the motivation for second home ownership into two broad categories: investment and vacation. Before 2004, traditional thought had the great majority of second home buyers motivated by the desire to have a vacation home. But a careful study of the 2004 second home market by the NAR revealed that 23 percent of second home buyers listed investment as the primary motivation for their purchase, while just 13 percent said they bought a vacation home. The NAR study seems to be supported by the experiences of Lisa Andrews, vice president of sales and marketing at Ford Plantation, an exclusive 1,800-acre gated development 20 miles south of Savannah in Bryan County. The modern Ford Plantation is built around, appropriately, the second home of Henry Ford, legendary founding father of the Ford Motor Company. Once a rice plantation worked by slaves, the Ford property rests beside the languid waters of the Ogeechee River and the Atlantic Intracoastal Waterway. Only 150 homes have been built or are under construction and plans call for the plantation to be built out with about 400 homes. But Ford Plantation is hardly a sleepy coastal village. It boasts two Olympic-size swimming pools, a 6,000-square-foot sports complex, a 22-stall, state-of-the-art equestrian facility with 22 acres of paddock, a deepwater marina with 65 slips, and a fulltime naturalist to lead ecotours of the famed barrier islands off Georgia’s coast. There’s also the requisite golf course and restaurant offering fine dining with linen and silver. With a seemingly unbeatable combination of amenities and atmosphere, why not make Ford Plantation a permanent home? It’s happening, Andrews says. “The trend here seems to be for the second home owners to become permanent residents,” she notes. Celia Dunn has been selling coastal real estate for 32 years and recently spotted what she believes could be the beginning of a trend in the Savannah second home market.